New puppy? Looking to compete in dog sports? Need help resolving a frustrating behavior issue? Fuzzy Logic is located in the town of Louisa, Virginia, halfway between Richmond and Charlottesville. We are approximately 8 miles from 64, and 1 exit from Zion Crossroads. Merissa's friendly approach, combined with her knack for reading a dog's behavior and figuring out what he needs has made her a popular dog trainer in the Richmond area for many years. She has been invited to judge for 4-H events (most recently judging agility at the State Fair), and she frequently teaches seminars and workshops on a variety of training topics. Merissa also recently presented a series of information sessions to the nursing students at Hanover High School in Hanover County about service dogs, emotional support dogs, and therapy dogs, and their specific functions. We offer personalized training services to help you and your dog achieve your goals (whether they are getting that obedience title or just keeping Fluffy from becoming a household menace). You can choose to attend one of our reasonably priced group classes or you can opt for private training. Fuzzy Logic Dog Training is the owned and operated by Merissa Kreidler, CPDT-KA, KPA CTP. You can read more here. Occasionally I like to talk about dogs and training. Even when I don't have the time to put my thoughts down, my friends do, and I love to share their posts. You'll find all that stuff here. 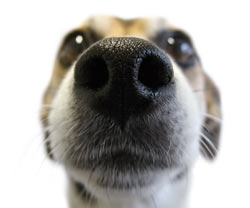 For the Dogs Only page, nose-bump here.